It’s Washington, DC, 1971, and The Washington Post is about to become publicly traded in the Stock Exchange. Katharine “Kay” Graham is the newspaper publisher, a family business she has come to lead after her husband—who had been in charge since Kay’s father gave him the leadership—committed suicide. The bankers are skeptical that the newspaper will make profits, and skittish about a woman running the show. They want the family to surrender more seats at the board of directors to boost investors’ confidences and ease their own minds. It’s not a reflection on Kay’s competence. An adviser tells her that “if she wants her company to be more than a family paper, it has to be more than a family business.” Outside events will conspire to get them there. Robert McNamara, Secretary of Defense under John F. Kennedy and Lyndon Johnson, and Kay Graham’s personal friend, tells her during an informal dinner that the next day The New York Times is going to publish an editorial that will be detrimental to his image. As it turns out, McNamara had commissioned a study on U.S. involvement, first in Indochina, then Vietnam, dating back to thirty years, from Truman’s administration to LBJ’s. As of five years prior (1965), the study had pointed out that the Vietnam War was not going as planned and that things were actually getting worse. Upon the Attorney General’s suggestion, President Nixon not only threatened legal action against The New York Times, but barred them, through an injunction, from writing subsequent pieces on the basis that they were disclosing secrets of national interest. The Washington Post and other papers had always played “catch up” with The New York Times. This time, however, The Washington Post’s editor, Ben Bradlee, urged his editorial staff to track any possible source that would get them a copy of McNamara’s report. One of his journalists knew a guy, and got the report, all 1000 pages of it. In a marathon session, Bradlee’s staff pieced together memo after memo—the original page numbers were missing—and wrote an editorial piece. Two legal advisers came to give their input, and it was up to Kay Graham to decide if she risked going to jail in defiance of the legal injunction from the president, and publish the piece. Her decision made history on several fronts. 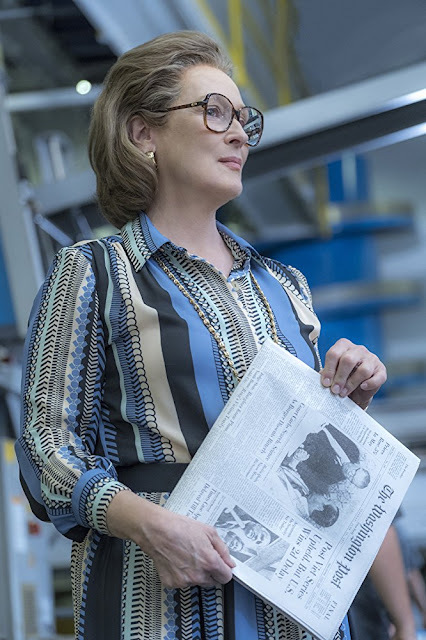 The Post is written by Liz Hannah and Josh Singer—whose screenplay provide plenty of quotable moments—, has a running time of 115 minutes, and is directed by Steven Spielberg. It stars a star-studded ensemble cast led by Meryl Streep (Katharine Graham), Tom Hanks (Ben Bradlee), Tracy Letts (Fritz Beebe), Bruce Greenwood (Robert McNamara), Bradley Whitford (Arthur Parsons), Sarah Paulson (Tony Bradlee), Bob Odenkirk (Ben Bagdikian), Matthew Rhys (Daniel Ellsberg), and Michael Stuhlbarg (Abe Rosenthal). 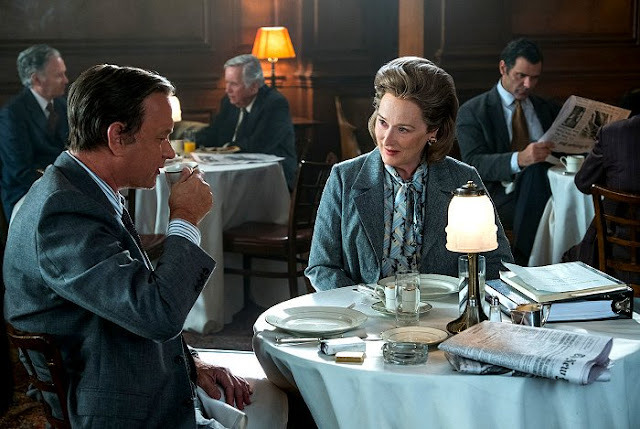 An artsy film directed by Steven Spielberg is sure to exhibit outstanding technical elements, and he is sure going to elicit great performances from the actors’ ensemble. The Post has both of these in spades. Right from the opening scenes we are treated to clever use of sound in the form of heavy artillery fire in battle that becomes the whirring of a helicopter that then becomes the clapping of a typewriter’s key while Dan Ellsberg—who works for the Embassy and is observing the troops in the Hau Nghia Province in 1966—types out his impressions on the Vietnam War. The heavy casualties from the battle he just witnessed firsthand, added to the darkness, heavy rain and heavy artillery fire—ghost images of the war—are overlaid Dan’s face while he reminisces on the plane on his way home. Also, archival footage of U.S. Presidents from Truman to LBJ appear on screen negating their involvement in Indochina, then Vietnam, while the documents being photocopied tell the opposite story. The Post is very much a drama, but it has the making and the urgency of a thriller—legal, and of the journalists-chasing-a-story kind. There are lots of formal entertaining—family’ and friends’ parties, informal dinners, etc. )—contrasting with the hunting for a newsworthy story, as well as plenty of business discussions about the newspaper going public, legal maneuverings on the possible implications for investors (if the newspaper publishes a controversial story), for the public (if a political administration is allowed to dictate what can or cannot be published), and the highly likely scenario that a judge could send The Post’s editor and publisher to jail for defying the legal injunction. Tom Hanks’s Ben Bradlee has a cavalier attitude at times, a non-intrusion policy between him and his boss, Kay Graham, and he is a no non-sense sort of man, very assertive, who gets the job done. Kay Graham is a woman who has taken the rein of the enterprise that was her father’s life, and that he passed to her husband upon marriage, which she accepted because women were expected to hold the job of a housewife back then. She never thought she would have to work outside the home, much less take control of her family’s company, until her husband committed suicide. 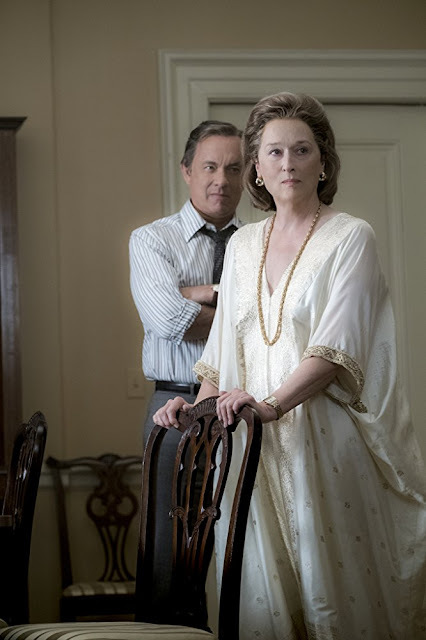 All that presses on her, and Meryl Streep does a marvelous job of conveying, via spot-on facial expressions and mannerisms, the vulnerability, the doubts, and, ultimately, the sense of empowerment that comes from making transcendental decisions of one’s own. It is impressive to see how much work you did to tell the whole story contained in this movie. I might watch it again because on my first viewing I did not know much about what was behind the story, so even though I thought it was great there was even more to its greatness. Also, as time has gone by in the past year or so, the story has even more relevance today as far as freedom of the press goes and the pressures put on that freedom. Well, to be honest I've gotten in the habit of taking notes while I watch movies, particularly the award-winning ones, which I'm typically watching now between two and three times before I write my review. I've sat on The Post review for a while, thinking what I wanted to say. I hope I did the subject justice. I agree that its topic seems more relevant in our current political climate than probably ever before. Synchronicity - I just heard a discussion of this movie on public radio over the weekend and now here you are with your review! We missed it when it was in the theater but I'm looking forward to seeing it. 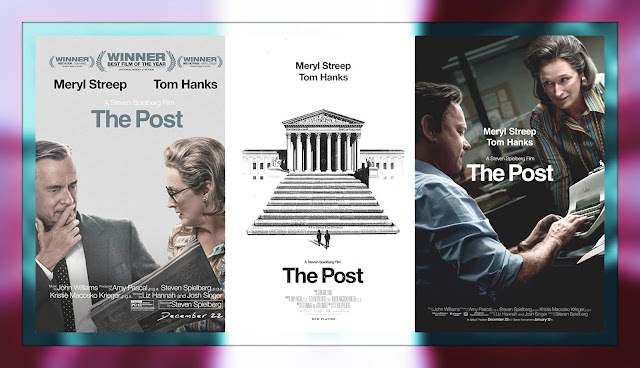 My husband (who was an editor at at another Post - the Houston Post) was and is a big fan of the major players at the newspaper of that period, so we really must see it. Wow, even far apart we are in tune! ;-) How cool that your hubby was in the newspaper business. I did like the movie a great deal, but he, being familiar with the ins and outs of the trade and personalities involved, may find things off with the movie. Still, I hope you both enjoy it. We really enjoyed this movie on the big screen; hope to catch it again on tv. Thanks, Susan. The praise means a lot coming from you. 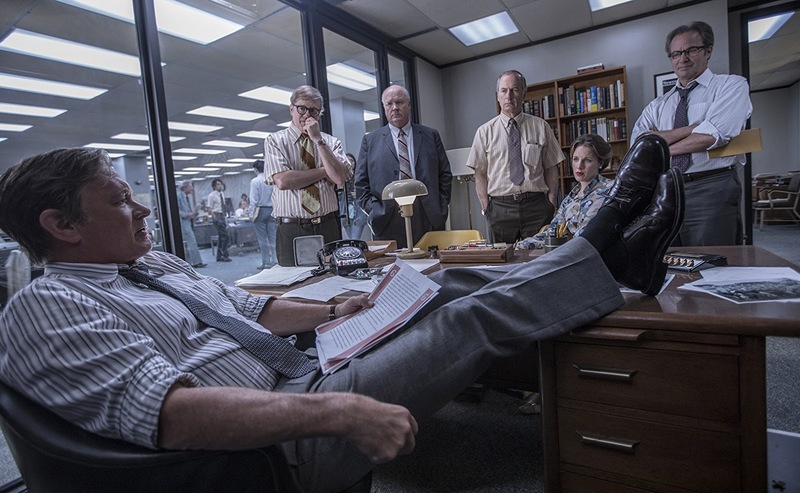 :-) I, too, think they captured the magic of printing and making a tight deadline, as well as capturing the dynamics of the larger-than-life personalities in the business. Ahhhh, those were the days! Also, the movie ended with a nice touch as it linked this chapter with the next, namely the Watergate scandal. Thanks for providing your link, as I was planning to do a search on your site to see if I could locate it. We will definitely watch this at some point - my other half is keen so he'll keep us on track with that. Great review. Thanks, Lynn. Do not miss it. I recommend it a great deal.